“Never stop learning because life never stops teaching.” My grandma lived to be 93 years old and up until the few months before she passed away, she took a variety of classes, ranging from English to Chinese painting and calligraphy to a computer class. She had her own computer and iPad and learned how to Skype. She was even on Facebook! This not only allowed her to keep in touch with her grandchildren and great-grand children, it also kept her mind sharp until the end. (Well, she also did Sudoku puzzles.) In my opinion, having a sound mind and being able to understand and communicate with others is one of the most important contributors to quality of life. 2. Stay busy and active. “Age is just a number. You can’t help getting older, but you don’t have to get old.” The body changes as we age and that’s part of living. I’ve met many people who compare themselves to their younger selves and get caught up in their own self-imposed expectations that they should be as nimble or as fit as they once were. The truth is, we can’t go back in time. Those who seem the happiest are those who don’t compare themselves to others or to their younger selves but instead embrace their potential and ability where they are now and keep moving. After all, if you don’t use it, you lose it! My friend, Helen, is 86 years old and continues to go camping and hiking in the summer and cross country skiing in the winter, often getting out on the trails 2-3 times a week! 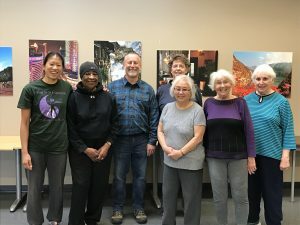 If she’s not out in enjoying nature, you can find her at the community center walking and participating in the group classes. She’s always doing something. Being active improves your functional status and as a bonus, it comes with a healthy dose of endorphins! “You don’t stop playing because you get old; you get old because you stop playing.” I was watching a kid’s camp the other week and these children were running and screaming and laughing and having a good time, without a care in the world that anyone was watching. When do we lose that ability to just let go and play and, more importantly, can we get it back? I sure hope so. Why let societal expectations restrict us just because we’re older? My grandma loved to play games. Whenever we had a family gathering, she’d want us to have games ready. Over the many years, we played Charades, Mafia, Hearts, Mah-Jong, and Chinese checkers, to name a few. She even made her own Bingo set! It was her way of relating to her children, grandchildren, and great-grandchildren and taking age out of the equation. Having fun and laughing together from the oldest matriarch to the youngest great-grandchild strengthened our family bonds and are some of my fondest memories. It made us all feel like children again! 4. Surround yourself with positive people. I think this is the most important because no matter what you do or don’t do, your attitude will be different depending on who you surround yourself with. Choose to be around positive people and all of a sudden, you start taking on an optimistic perspective of life and things don’t seem that bad. My grandma used to say, “Eat the best strawberry first because as you keep eating, you will always eat the best one until the bowl is finished.” I am so grateful to be part of an inspirational community center full of bright, energetic, fun-loving people. Every visit is greeted with smiles from friends and strangers who are trying new things, staying active, and having fun. Every healthy adult I want to be like has a positive outlook. I leave feeling more energized and happy, always with a smile on my face because it’s contagious and this is how I want to live every moment! Reviewing this list, it’s not so much about healthy aging as it is about optimizing health, at any age. After all, age is just a number and life is about living. Hopefully, with these lessons in mind, we will not only be able to live longer but also be able to live life to its fullest! If you’d like help living life to YOUR fullest, contact me here. Pictured above are some of the inspirational, vibrant, fun, active, and more life-experienced individuals I am honored to rub elbows with.